LEEDS UNITED are being linked with a move for Manchester City defender Jason Denayer. The Belgian is also wanted by Turkish giants Galatasaray on a season-long loan, with the 23-year-old having spent two previous spells at the club. According to reports in Turkey, Leeds - also keen on bringing back Everton defender Matthew Pennington to boost their central defensive options - are preparing a big-money bid for Denayer. Speculation remains rife regarding the future of Hull City’s wantaway Polish international winger Kamil Grosicki, with clubs from England, Italy and Qatar said to be interested, along with French outfit Stade Rennes, one of his former clubs. The Tigers have been willing to listen to offers for Grosicki all summer, but with just a week to go until the transfer window closes, he remains at the club. Burnley are mulling over whether to table an improved offer for Middlesbrough captain Ben Gibson after seeing a £12m opening bid turned down. On his way from Tigers? : Poland's Kamil Grosicki, left, and Senegal's Salif Sane fight for possession at the World Cup. Boro value Gibson at a higher fee, with Everton also linked with a beat-the-deadline move. Wolves are set to made a fresh bid for Boro winger Adama Traore. The Teessiders rejected a £12m offer last week but he has an £18m release clause, with Newcastle United and Huddersfield Town also interested in Traore, whose current contract at the Riverside Stadium runs until the summer of 2020. George Maris’s potential move to Rotherham has been called off. Ben Gibson: Wanted by Clarets. The 22-year-old midfielder has been heavily linked in recent days and was reportedly having a medical, but the deal has been scuppered. 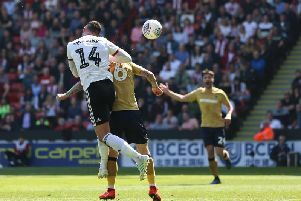 Bolton Wanderers chairman Ken Anderson has confirmed that his club did make a bid for former Bradford City frontman Charlie Wyke, ahead of his move to Sunderland this week - but stressed that the Trotters did not want to be involved in a bidding war. He said: “We made a six-figure offer for him which we believe accurately represented his perceived value. Doncaster Rovers are expected to follow up the dual signings of Paul Taylor and Herbie Kane by completing a deal to sign former Leeds United midfielder Romario Vieira today.